Since I recently (last fall) purchased a skinny water boat I decided to make good use out of it and take it down the Hooch to check out some serious site fishing to golden bonefish (carp that is!). I have caught them many years ago using a fly rod on the lakes back in the motherland (NYC). I even tried my hand some on it here in No GA on Lake Lanier. To pursue these fish on lakes and enticing them to eat the fly is similar to getting a republican to raise taxes (ahem….). In other words it is next to impossible to make these things eat! So I figured I would try to see if these river fish are a little more fly friendly. Bob Clouser (the Clouser minnow guy) is a friend of mine and has been fishing these things for years on his home waters of the Susquehanna River. He has for years been telling me how much fun they can be to stalk in shallow water. Well Bob could not have been more right! These fish are an absolute hoot (yes……the Yankee said hoot!). Poling around in water from 6” to 3’ allows you to sneak up on these bruisers and fish them as you would redfish or bonefish. You can even get out of the boat on some of these hard bottomed flats and wade for them. All it takes is an accurate caster in the bow and a willingness to pole someone around. I told my good buddy Gary Lowe Jr about it and he said let’s give it a shot. We poled around the area of Bull Sluice (above Morgan Falls Dam) and proceeded to find many happy fish tailing, cruising and EATING! This is a fishery I would recommend to anyone who is into hunting for their quarry. For tackle I would suggest a 7 or 8 wt rod w/floating line and 10 or 12lb tippet fluorocarbon leaders. Flies can range from swimming nymphs (a Clouser favorite) to egg patterns, wooly buggers and San Juan worms. 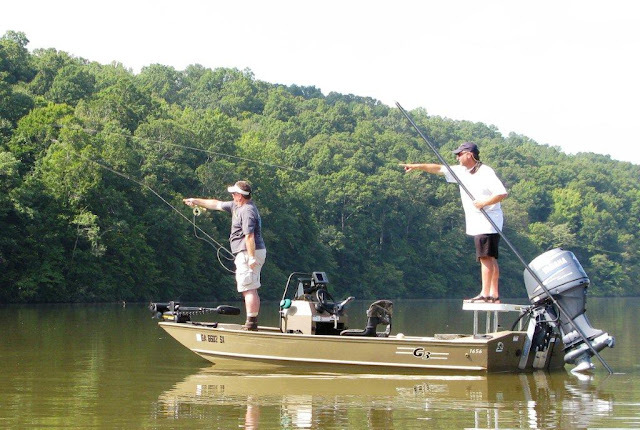 You will not catch many of these river carp BUT the satisfaction of searching, finding, casting and finally feeding one of these fish will have you hooked on a totally new game fish…….The Chattahoochee carp. Seize the day!!!!!!!!!!!! !